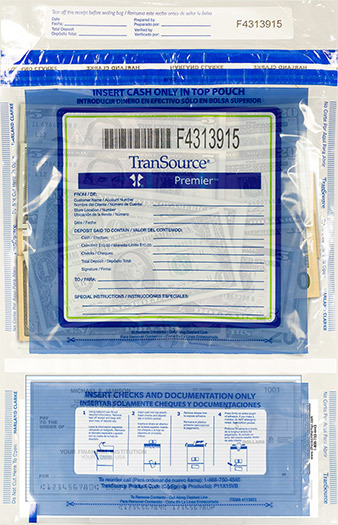 The TranSource Security Bag product line is made from superior-strength plastic and offers advanced security features preventing compromise from heat, cold or liquid. They are available in multiple colors, configurations and formats. Harland Clarke Branding prevents evidence of tampering from being concealed with a permanent marker. In-Line closure makes closing the bag correctly virtually foolproof and ensures maximum contact for adhesive preventing gaps in the side that can expose contents to theft. In-Line VOID self adhesive Tape Closure is permanent, tamper evident and simple to properly close. Closure consistent with industry standards. Tear Off Receipt on top of bag as a visual reminder for customer and consistent with industry standards provides added strength and durability. Two color hidden VOID graphics protect against compromising under cold and normal temperatures. Bilingual - English and Spanish. 3/8” pouch seals add strength and durability. Thermochromatic ink detects tampering from heat. Custom ink indicator shows evidence of tampering from solvents or any liquid. 3/4” Unique Numbers and Bar Codes make bar code scanning easier and more reliable. Centerfold Construction reduces chance of failure and eliminates another point of ingress on the bag.